Much is always said about politics being a total turn-off in this country, with politicians and their supporters acting like trolls or being trolls 24/7. Who wouldn’t be turned off if the President himself says one thing and does another? It turns us off whether it is the President of Daang Matuwid being exposed either as Pork Barrel King or Protector of the Incompetent, or the President of Tapang and Malasakit applying those powerful virtues wrongly to narcopolitics (malasakit) and their victims (tapang). It turns us off whether it is the supposedly upright kind who saw no evil in the Yellow reign of t/error, or the new gang who revels in exactly the same way of thinking in the current dispensation. We bewail the fallacies that inundate politics, and they are too many, too frequent, too shameless. We get easily frustrated because when we try to speak about things that are important to us, about things that need to be addressed, and about what the authorities should be doing, there would be someone or some group that would throw a mindblowing monkey wrench. We get pissed off when spokesmen — official or unofficial — either do not answer us, humiliate our concerns, or try to shoot them down as mere politicking. And we easily get waylaid by the trolls and their trolling. We quote them. We answer them. We fight back. But in so many or most instances, our original messages, concerns, and issues would get lost along the way in our quest to defeat and crush the trolls. The trolls end up winning even if they lose the argument — because they were able to catch our attention and to lose our attention on the target. Come to think of it, our political system is a system inhabited by trolls hiding behind “respectable” names and respectable reputations of generations past. They don’t offer well thought-out solutions to problems. Often, they offer comedy or drama. Their trollish nature and mindset lay out the map for their diehard supporters. We enable the trolling by not challenging both the administration and opposition. We enable the trolling when we accept pathetic excuses about “being early to pass judgment” on the same new regime that proudly proclaims its “achievements” in its first 50 days. We enable the trolling when we are silent on the hypocrisy of the so-called opposition who betray the people’s expectation of checks and balances when they split themselves into two: one big part in a lip-lock with the ruling coalition, and a small part hijacking the minority that is supposedly reserved for fiscalizing and dissenting. We enable the trolling by voluntarily slicing and dicing ourselves into pro-Duterte, pro-Marcos, pro-Aquino. And when we needlessly and baselessly create a gap between the educated and the jejemon. And when we do not immediately and forcefully crush the wrong use of the total votes of either Aquino (15 million?) or Duterte (16 million) as “arguments” to silence a nation of 100 million people or even a small minority. We enable the trolling when we promote impunity, just to save political idols we believe in. Never mind justice because the Aquinos are God’s gift. Duterte can do no wrong. What kind of stupidity is this? What kind of democracy? Trolling is by no means endemic to the online space. It is a mainstay, a feature and a hallmark of this system. We must stop enabling it, in the same way we take out the unnecessary information in our daily personal decisions. 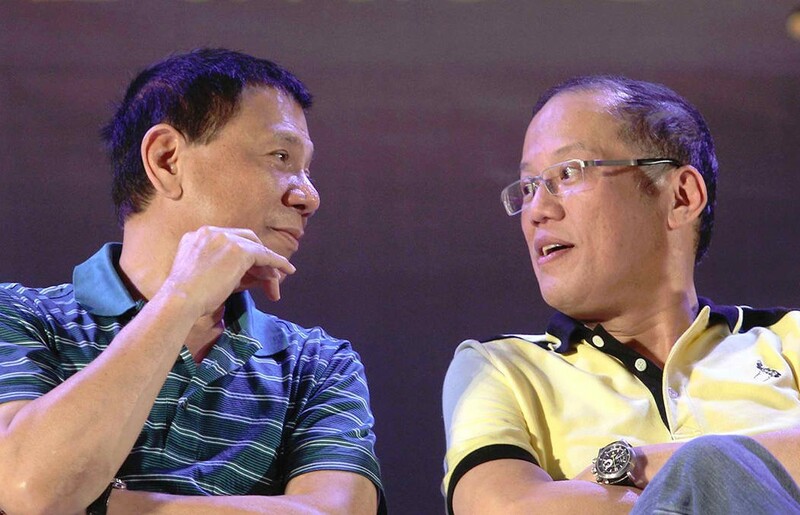 Some would say it is the absence of a credible opposition that enables Duterte. But the opposition is no less trollish. Take a look at how they handle the issue of extrajudicial killings and the rampaging anti-drug war. They have prioritized the defense of the old regime over the defense of the people. And they gladly tangle with Duterte with all the loudest noise and fury, but we don’t see any benefit at all from their drama. Make no mistake: We should stand up to Duterte and his trollish ways, and also lambast the opposition for depriving us the honor of having credible dissenters. In other words, we must resist the false narratives of trolls about the Philippines merely being split into rival camps. That is wrong, as we have seen in the past and as we see in the present. We must stop enabling the trolls by totally ignoring them. They may be too hard to ignore, as they have become experts in drawing attention to themselves and snatching our attention from our gaze at authorities who we wish to watch and hold accountable. They have had six years of training under Aquino, and the new ones blaze the trail for new low levels of trolling. We simply cannot afford to allow them to endlessly hijack and hostage our public conversations and public discourse — and ironically, with our permission. Let us stick to the basics: We are all Filipinos, and we all have rights. Our government should serve the Filipino people and be accountable to all. Public office is a public trust. We have many real problems that demand real solutions. Everyone has a stake in diagnosing and solving issues. There should be a preferential option for the poor. People are innocent until proven guilty. Peace should be based on justice. The root causes of Armed conflicts should be addressed. History is important. And so on. Each step that takes us away from the basics is a step closer to the trolls or end up joining them. Or worse, we become trolls too especially when we use the same base mindset and squid tactics. And when that happens, we defeat ourselves politically and morally. We become mirror images of the immoral political beasts we have long wished to defeat. Parang kinain na tayo ng sistema. Panalo ang sistema. I fully agree with your Hotspot in Manila Bulletin, 17 January 2017. Perhaps tax reform should also consider the BIR’s confiscatory withholding tax of 20% slapped on all interest earned by people’s savings that are invested in government and corporate bonds yielding only 2% to 4% per annum.